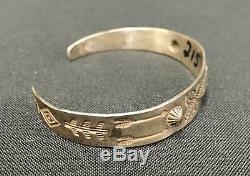 Maker: Most likely Navajo or Pueblo, but there is not a maker's mark (as was common of Native Style jewelry from this era). Size: Inside circumference measures 3 3/4 inches plus there is a 1 1/8 inch gap. It is 1/2 inch across at the widest point! Condition: Vintage, good for it's age, normal wear expected. The Fred Harvey era refers to Native Jewelry items made in the early 1950s back to around the turn of the last century. 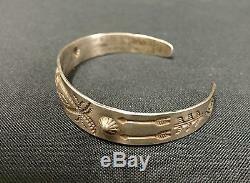 This great old silver bracelet features hand stamp work. 925 or at least coin. Please look closely at the pictures as they are an important part of our description. Western Trading Post is family owned and operated. Located in Arizona just north of the Tohono O'odham (Papago), just south of the Akimel O'odham (Pima), just east of the Ak-Chin O'odham (branch of Pima) and only a short driving distance from the Apache (N'dee), Navajo (Dine'), Zuni, Hopi, Yavapai, Mojave, and Hualapai. We specialize in Native American Indian and Cowboy items. THANK YOU for your business. We also have monthly auctions at our store. Check it out at Western Trading Post. THANK YOU for your business! The item "Fred Harvey Era Bracelet Sterling or Coin Silver Old Tourist Era Collectible" is in sale since Tuesday, October 31, 2017. This item is in the category "Jewelry & Watches\Ethnic, Regional & Tribal\Native American\Bracelets". The seller is "westerntradingpost" and is located in Casa Grande, Arizona.